Happy Tree Friends Terror Never Tasted So Good! Welcome to Curiouser and Curiouser’s first ever guest post, submitted by my dear kawan (friend) Gwynne Middleton. Gwynne is an amazing writer (she recently sent me a portion of the novel she’s working on, and it’s stellar), as evidenced by her great food blog you should definitely check out and the environmental journal, Precipitate, she edits. Gwynne lives with her fiance, Cameron, in Denver, along with their cat, Waffles, and brand new pup, Charlotte. Anna and I became friends in 2008 when we were offered fellowships to teach English in Kuala Terengganu, Malaysia. Hailed as the heart of “real” Malaysia, Terengganu was not only one of the wealthiest states in the country; it was also one of the most Muslim. 95% of the population lived as devout Muslims. For the first time in our lives, we dwelled in a land ruled by sultans. The lovely Mrs. Keller (then Miss Swindle) and I shared an airy flat in a government-housing complex located a few miles from our respective teaching sites. Like the perfectly timed, tinny call to prayer that sounded five times a day from the PA speaker aimed directly at our windows, we could always count on one of us to return to home with a memorable story from our school. One particularly humid afternoon I was sprawled on our sofa watching re-runs of Flight of the Conchords while fashioning new angles to keep my sweaty limbs from touching (Dead Man’s Float was the clear winner) when Anna came home and asked if any of my students had shown me an episode of a cartoon called Happy Tree Friends. When my studious kiddos weren’t reciting Shakespearean soliloquies or undertaking yet another all-day exam, they often chatted about Malay pop culture. For the girl students, hands down Happy Tree Friends ranked #1, but they had yet to share a clip with me. From their sweet demeanors and the innocent conversations they’d shared with me, I assumed their favorite show included a cast of smiling animals frolicking in the woods whose most devilish hi-jinks included swiping honey combs from angry bees or planting the wrong flower seeds in their carefully planned gardens. That day I also learned that my middle and high school students were infinitely more complicated than I’d given them credit. For the first few months of teaching and supervising after-school clubs at the school, I’d encountered quiet, shy, constantly smiling students, but in addition to their meticulously pinned tudongs and spotless baju melayu, my students possessed both sincere religious piety and a love for the grotesque. As a writer, I’m fascinated by the psychological workings of the folks I meet. Watching several macabre clips from their favorite cartoon gave me a taste of the rich, off-kilter sense of humor that had been often concealed behind the self-conscious, laugh-hiding hands of my students. If someone had told me that an animated series that included tittering psychopathic cartoon characters mowing down pedestrians would bridge the American-Malaysian cultural divide, I would have dismissed him, but suddenly I was engaging in surprising conversations with young people about supernatural phenomena in Malay myths. It was after my introduction to Happy Tree Friends that I invited my upper form mentees to spend the afternoon with Anna and me for a cookie baking movie hangout session. Home ovens aren’t popular in Malaysia since traditional Malay cooking doesn’t include baking, but Anna and I made good use of a borrowed toaster oven for our cookie-making marathons. At the time we used her family’s favorite cookie recipe, which the kids loved. 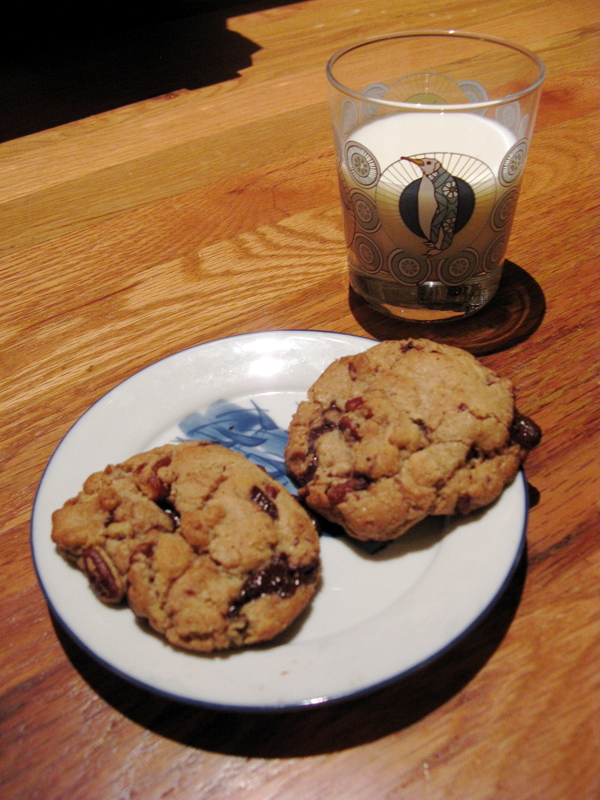 Below you’ll find an alternative take on the tried and true chocolate chip cookie. Enjoy! In a medium saucepan, melt the butter over medium heat. Once the butter is melted, increase the heat to medium-high and stir constantly until the butter turns a dark amber color. This should take about 4 minutes after the butter is melted. Allow the butter to cool to room temperature. In a large bowl, beat the butter, granulated sugar, and brown sugar until creamy. Add the eggs one at a time and beat until incorporated. Add the vanilla. In a separate bowl, whisk the bread flour, oatmeal flour, baking soda, baking powder, and salt until combined. 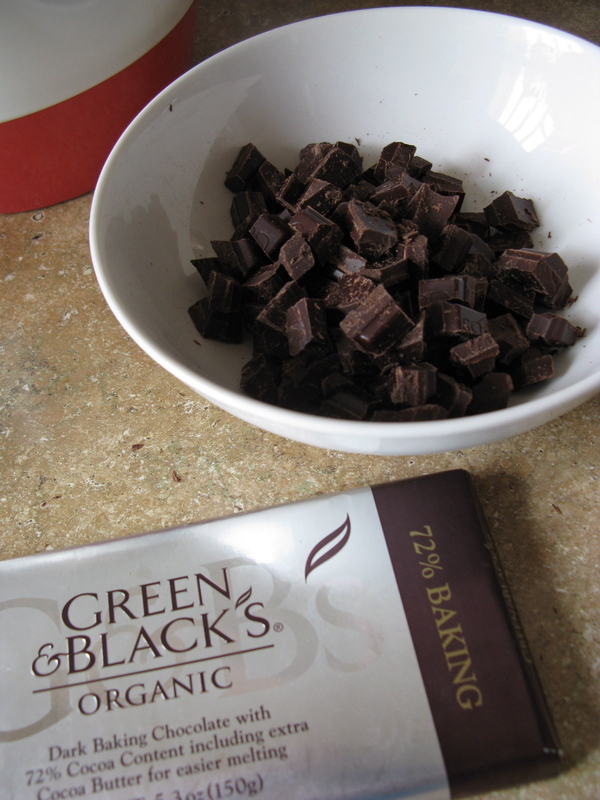 Gradually add the dry ingredients, mixing until well combined. Scrape down the side of the bowl as needed. 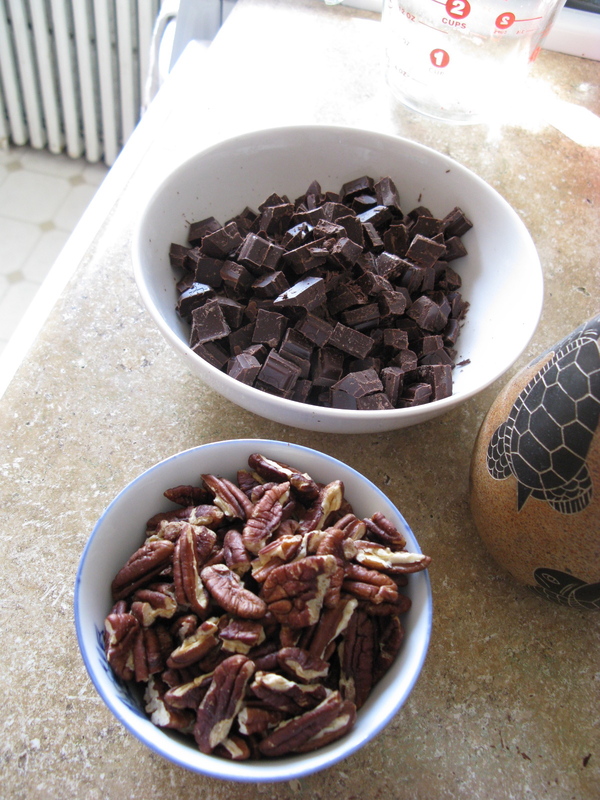 Remove the bowl from the mixer and add the chocolate and pecans. The dough will be very thick. I used my hands to mix the chocolate and nuts into the dough. By AnnaIn Exploration and Adventure, Food Stuffs, Guest PostTagged guest post, gwynne, happy tree friends, kawan, malaysia, terengganu8 Comments on Happy Tree Friends Terror Never Tasted So Good! Thanks for the reminder, Ez Too much tropics sweat on the brain left me with amnesia. To be fair, I have to say my students and our ETA gal pals were more stylin’ in their bajus than I was. I fear polyester something fierce!